Valentine's Day event kicks off today at 11am PST. 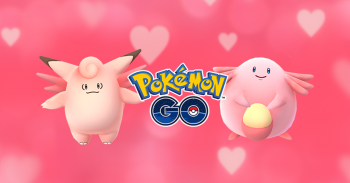 Niantic has announced its next limited time Pokemon Go event, this time in celebration of Valentine's Day. The event will run from 11:00 A.M. PST on February 8, 2017, to 11:00 A.M. PST on February 15, 2017. The event will be similar to previous Pokemon Go events - players will see double the amount of candy earned for catching, hatching, and transferring Pokemon in the game. In addition, buddy Pokemon will be earning Candy twice as fast as they normally do. In addition, players will see increased encounters with specific Pokemon. Chansey and Clefable were specifically mentioned as having increased spawn rates, along with "many other adorable pink Pokemon." The post also states that players will be more likely to hatch Cleffa, Igglybuff, and Smoochum from eggs. Finally, lure modules will last much longer than typical - a whopping six hour each, to be exact.